Hi everyone! Today's recipe is a delicious and super easy recipe to make Soy meatballs! I hope you like it, these are great as an appetizer and even better if you serve them with your favorite tomato sauce over your favorite pasta! Enjoy! Once the soy meat is hydrated, now drain it. Use your hands to squeeze all the liquid out of the soy, you want the soy meat to have the texture of ground meat, so squeeze all the liquid out of the soy meat. Now in a small bowl, combine the ground flax seed with 6 tablespoons of water, and pour this mixture over the soy meat. Also add in 1 egg, mix everything together (if you are not using the flax seed, beat 2 eggs together and pour them over the meat!). And now add the rest of the ingredients, add in the onion, cilantro, and garlic; season with salt, ground black pepper, and chicken flavor bouillon to taste, (Italian seasoning, fresh herbs or whatever seasoning you like!) Also add in the yellow mustard and the ketchup, stir together, until well combined, then add in the dry breadcrumbs and 1 tablespoons of extra virgin olive oil. Mix together, until all the ingredients are well incorporated and now you are ready to make the meat-balls. To make the meat balls, now grab some of the soy mixture, and roll it with your hands into a ball, you have to squeeze the meatballs with your hands really well, to make sure they don't have any extra liquid in them, so as you form the balls, give them a few squeezes in between your hands, this will get rid of any extra moisture in the balls, and will allow them to be stay tight and together while cooking. Place the soy-meat-balls in a baking sheet and bake at 390ºF for about 20 minutes. 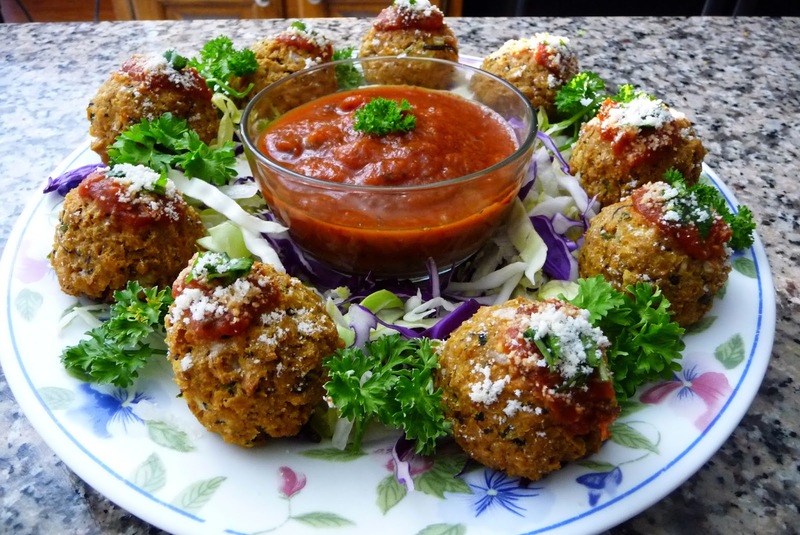 Serve as an appetizer, top them with your favorite tomato sauce, fresh parsley and Parmesan cheese. Or if you prefer, bring your favorite tomato sauce to a boil, then add in the baked soy-balls, cook for another minute or so, and serve over your favorite pasta.